His first adopter had an eight-month-old child who thought Benny would make a good hobby horse. Benny disagreed and eventually snapped at the toddler. The family immediately returned him to the shelter. His second placement was to a family that already had a dog in residence that saw Benny as an interloper. The two dogs didn’t get along and instead of trying to deal with the situation, the family threw up their hands and returned him to the shelter. On his third try, Benny was placed with someone who had never had a dog. Apparently, this adopter didn’t understand when Benny needed to go out and after he peed in the house, Benny was once again returned to the shelter and this time in only one day. After three tries, the shelter called the Greater NY/NJ Scottie Rescue to take Benny. Erica from the rescue drove up to get him expecting, after three unsuccessful placements, to find a difficult dog that would prove to be a handful. Instead she found Benny to be a nice, well-behaved dog. Despite poor placement attempts, the shelter had arranged to have him neutered and brought up to date on his vaccinations. However, Erica took Benny to the rescue’s vet to make sure there were no issues. Happily, Benny is heartworm free and has no health issues. 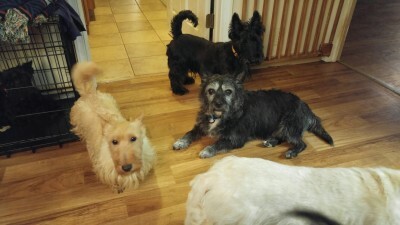 Benny has been in a foster home with other dogs and seems to get along fine. He plays with many of the others, and there have been no fights or issues. He gets along with people and other dogs and has not peed in the house. Benny is looking for a forever home where he will have his own person and an atmosphere of relative peace and quiet. Young children would not work for Benny, but an older child who understands how to treat dogs would be fine. A relatively active senior citizen or couple would work, too. Benny does not need a fenced in yard as he enjoys walks and would even be up for hikes. But, he is not high energy and would also enjoy cuddling on the couch and watching TV with his person. 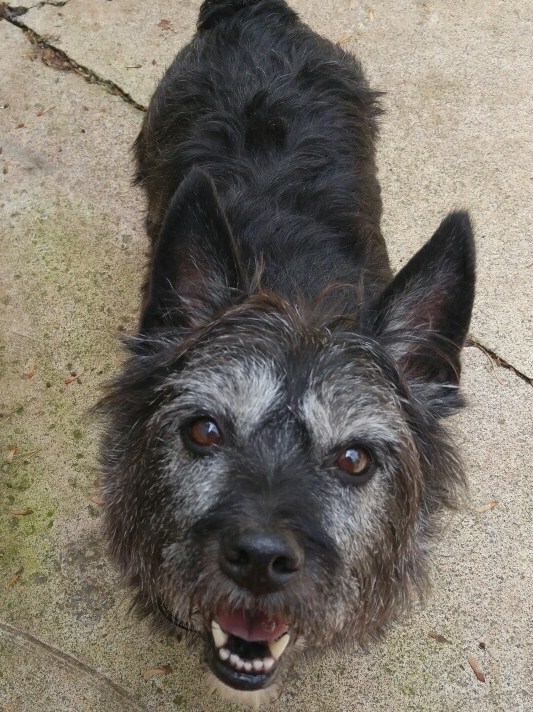 Erica says Benny is a perfect gentleman and an easy dog to love and enjoy. The fact that he is not the most handsome of dogs is not important. After all, beauty is in the eye of the beholder. 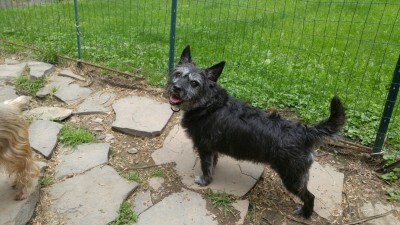 I was surprised and pleased that a Scotty rescue would consider taking a mix-breed. So many breed rescues don’t. Neutering will help with the socialization problem but the right family will be the best solutions. Wishing the little guy the best of luck in locating that right family. Mother of four rescues. I hope Benny finds the perfect home. He is a handsome guy. And every baby deserves to have someone who loves them dearly. Is Benny still available ?